So, here they are finally, the last missing cards from the #52cafecards #MaremiWhisperBoard challenge. I did have 3 cards ready and a couple of backgrounds, too. I made them sometimes last year, I think. But then life happened (I got a job for a short period) and I was then too busy and tired to even think about creative work. A couple weeks ago I sat down and started making these simultaneously a few cards at a time. I went through the Maremi's Creative Cafe Facebook group's albums and searched for the Whisper boards that I still hadn't done. I wrote down some notes and ideas for each card. I gessoed the background base cards and some of them I stenciled, too. Then, I got creative. I struggled with some cards but in the end I managed to get them finished. 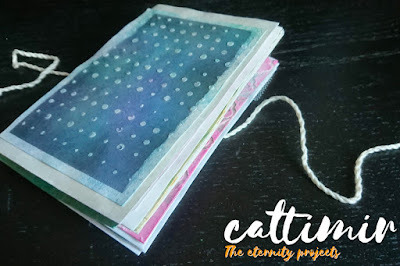 Remeber my "The blog must go on" post where I promised to show more of my very first art journal? Well, I finally took the photos and here you are - my first attempts on mixed media. Maybe not _the_ very first but the first ones that made me take this path and I'm still on it. This is definitely the first art journal that I have and the only one, too. I have thought about buying an art journal book but it might take a long while before I would do anything with it. I mean, I have bought small canvases and I have still not used them. I guess, I'm saving them to make a perfect art piece on them and we all know that won't happen in a long while. Not with my skills anyway, not yet.